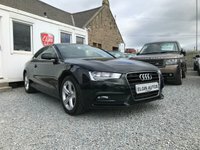 Elgin Autos is a family run business located in the centre of Elgin, Morayshire and have had many years of experience in the motor trade within the North-East of Scotland. We are situated between Aberdeen and Inverness with good connections to the railway and airport nearby. We specialise in a wide range of second-hand motor vehicles from small hatchbacks and minis to the most prestige cars and 4x4's in order to suit all budgets and different lifestyle's. So we are sure to have the right car for you. Here at Elgin Autos, we stock the highest quality used vehicles in the North East of Scotland including Aston Martin, Audi, BMW, Jaguar, Land Rover, Mercedes-Benz, Porsche, Volkswagen and many more to satisfy your buying needs and to find the right car for you! In order to make sure we stock the right car for you, we make sure to update our stocklist on a regular basis. So, don't hesitate to call us today or feel free to browser our website and search through our wide range of quality used vehicles we have in stock. Peace of mind with your purchase, with 3 months free comprehensive cover with all vehicles sold. Use your part exchange vehicle as your deposit. Competitive rates paid for your vehicle.